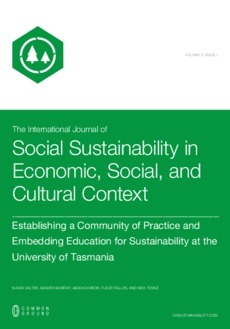 The University of Tasmania Education for Sustainability Community of Practice was established in September 2011 to bring together staff and the wider non-university community (e.g., non-government organisations, primary and secondary schools) with the goal of embedding sustainability as a core focus of the university curriculum, research activities, operations and community engagement. The establishment of this institution-wide Community of Practice is discussed within the context of engagement with the wider University of Tasmania community to raise awareness of, and participation in, Education for Sustainability initiatives. The paper documents the creation processes and includes opportunities and challenges encountered by Community of Practice members. Areas of discussion include greater collaboration across disciplinary boundaries and between academic and professional staff members. The major themes for these discussions were - the ‘idea’ of sustainability; the social responsibility of the wider university community; the teaching-research nexus and the student experience; community engagement; institutional leadership.